What Bullhorn CRM Triggers and Actions are Supported? Entity Added to Tearsheet - Triggers when an entity is added to a specified Tearsheet. New Opportunity - Triggers when a new Opportunity is added to Bullhorn. New Candidate - Triggers when a new candidate is added to Bullhorn. Updated Lead - Triggers when a lead is Updated in Bullhorn. New Task - Triggers when a new Task is added to Bullhorn. 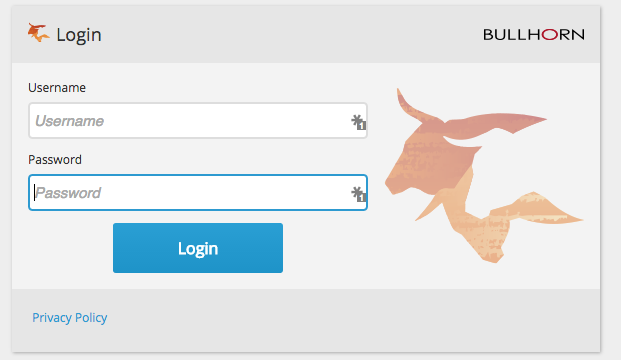 New Project - Triggers when a new Project is added to Bullhorn. Updated Opportunity - Triggers when an Opportunity is updated to Bullhorn. New Lead - Triggers when a new lead is added to Bullhorn. New Contact - Triggers when a new contact is added to Bullhorn. Updated Contact - Triggers when a contact is updated in Bullhorn. Create Contact - Creates a new Contact. Create Lead - Creates a new Lead. Update Lead - Updates a Lead. Update Opportunity - Updates an Opportunity. Create Note - Creates a Note. Next, you'll be given the option to name your Account. This name is really just a label for your own use, it has no effect on which Bullhorn CRM account you'll log in and connect to Zapier. You also need to select which data center(s) your account resides within. Note: It is very important that you choose the right data center(s) otherwise authentication will fail. 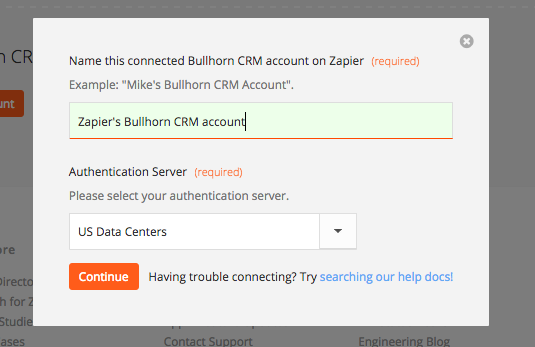 You'll now be given a popup and asked to login to Bullhorn CRM (unless you are already logged in). It's that easy! Zapier should now double check that the Account is working and you can continue on creating your Zap. Bullhorn CRM doesn't currently provide a contact's company or title for its "New Contact" Trigger.